Kagan's FREE Articles - There Is No "I" In Team - Or Is There? There Is No "I" In Team - Or Is There? Cooperative learning is all about the team, not the individual, right? Not entirely. Although in cooperative learning, students spend a lot of time interacting with teammates and classmates, the most effective cooperative strategies incorporate individual accountability. Ultimately, each student is accountable for his or her own learning. Let me elaborate. We try harder when we know someone will watch our performance and they will attribute the performance to us alone. We all want to be evaluated well by others. Situations that include individual accountability promote hard work, preparation, and persistence. Who wants to fail publicly? Who does not want to succeed in front of others? There are three critical components of individual accountability: 1) the performance is done without help; 2) someone witnesses the performance; and 3) the performance is required. Is individual, public performance required? 1. You can ask for and receive help during the test. 2. You can grade your own test and no one but you will see the score. 3. The test is optional. Individual Accountability increases achievement in athletics, in the workplace, and in everyday life. • The baseball player tries harder knowing her/his performance will be witnessed by thousands, and her/his RBI and batting average will be published. • The author gives extra effort to the book knowing that once it is published, her/his name will forever be linked to that book. • An employee gives extra effort knowing her/his productivity and error rate will be posted. • A politician prepares diligently for the debate knowing her/his command of and stance on the issues will be on display. 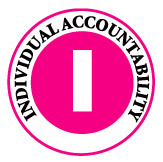 Thus, to release the full power of individual accountability, performance must be individual, public, and required. Tests, quizzes, individual essays, and individual performances such as reports and term projects are all powerful ways to structure for individual accountability. However, they are evaluation tools, not instructional strategies. The problem with exclusive use of evaluation tools to structure for individual accountability is that they are one-time events that occur well after instruction. Tests are poor motivators. They occur too long after instruction to motivate attention and effort during instruction. To harness the full power of individual accountability, we need to structure for individual accountability on an ongoing basis during instruction as part of every lesson. We can do that through instructional strategies that require an individual public performance. Whole Class Q&A, unstructured group work, and pair work lack individual accountability and should be used sparingly as more effective alternatives exist. Whole Class Q&A. In Whole Class Q&A, the teacher asks a question, students raise their hands, and the teacher selects a student to respond. There is individual accountability in this structure when the teacher selects a student to respond. A student must publicly display her knowledge of the subject. However, only one student in the entire class is held accountable for each question, and many students simply choose not to participate by keeping their hands down. When we ask if a structure has individual accountability, we ask if all students have to perform on their own in a way that will be known by at least one other. Volunteer participation fails the test for individual accountability. In working with teachers to convey the essence of individual accountability, Dr. Vern Minor explains individual accountability, as "You can't hide." Others will know what you know or how well you can perform. In Whole Class Q&A students can hide—they just don't raise their hands. Group Work and Pair Work. We have all had the experience of being in a group where one or two people did all the talking or most all the work on a project, while others did little or even nothing. The problem: lack of individual accountability. Just putting people into a group and telling them to cooperate does not make them do so. During unstructured group work an individual public performance of each person is not required, so some are likely to lie back while others do most or all the work. Unstructured interaction equals an option not to contribute. Even in pairs, with no structuring of the interaction, some can choose to do little or even nothing. If the teacher says, "Turn to your partner and discuss what should be the response of our country to the tsunami disaster," it is inevitable that in some pairs one person may do all the talking. The teacher who uses unstructured group work and pair work hopes each student will participate, but there is nothing in the structure that ensures participation by all. Group work and pair work is wishful thinking. 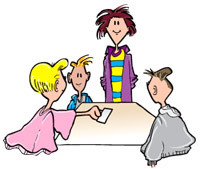 There are over 200 carefully designed instructional strategies called Kagan Structures. The Kagan Structures are designed to include individual accountability. One the most important reasons to use established Kagan Structures is that they create individual accountability on an ongoing basis as part of everyday instruction. For example, the teacher asks a question. The teacher then says, "In pairs, do a RallyRobin naming possible responses of our country to the tsunami disaster." After Partner A gives a response, Partner B has to give a response. Within a moment every student in the class has given an individual, public performance. No one can hide; an individual public performance is required by the structure. To take another example, the instructor stops and says, "Turn to your partner and do a Timed Pair Share. Describe your reaction to the disaster." In a Timed Pair Share each student shares her/his ideas for a specified time. Again, with little effort, no special preparation, and no change in the curriculum, the teacher creates individual accountability for every student using a simple structure. Knowing that at any moment there may be individual accountability, students are more alert, pay closer attention, process more frequently and more deeply, and retain and achieve more. Accountability "To Whom." Different structures have individual accountability "built-in," but in different ways. Students may be accountable to a partner, a team, the class, and/or the teacher. Reports home create accountability to parents. The greater the accountability, the greater the probability of achievement. In Numbered Heads Together, before students put their heads together each student writes their best answer on their own to share with the group. Thus each is held accountable to their teammates. Further, when a student's number is called, that student must share their best answer, so they are held accountable to the teacher and the class as well. In RallyCoach each student is in turn accountable for performing in front of a peer. Accountability "For What." Depending on the structure and the content, students are held accountable for different things. For example, in Paraphrase Passport, the right to speak is earned by making an accurate paraphrase of the person who spoke just before you. This structure holds participants accountable for empathetic listening. Talking Chips holds participants accountable for participating. In a RallyTable of prime numbers, learners are held accountable for listing prime numbers. If the RallyTable were filling in blanks on the periodic table, the learners would be accountable for a very different content. Individual accountability must be coupled with positive interdependence—otherwise it may backfire. For example, we can create very strong individual accountability simply by asking a question, randomly calling a number, and having the student with that number stand up and answer in front of the whole class. If we do that, however, many students will fail publicly and they will soon dread class, content, and the teacher. Learning and change come about best by a combination of pressure and support. Individual accountability creates the pressure; positive interdependence creates the support. Either without the other is ineffective. If we never quiz and never have students perform publicly, they will not achieve as well. However, if we do not provide plenty of instruction, tutoring, encouragement, and celebration of student accomplishments, they also will not achieve as well. One main implication from brain research is the importance of creating psychological safety in the classroom. If students are in a constant state of apprehension because they fear they may be publicly embarrassed at any minute, individual accountability may do more harm than good. A supportive environment is critical to the success of individual accountability. The Kagan Structures build in a combination of positive interdependence and individual accountability. For example, before doing problems alone in Team-Pair-Solo the students first do them as a team and as a pair, receiving plenty of tutoring, encouragement and support. The positive interdependence precedes the individual accountability so the student has received the necessary support prior to the individual performance. Similarly, in Numbered Heads Together the students have the support of their teammates (heads together) prior to calling a number and having them perform in front of the class. Enormous empirical research demonstrates that cooperative learning increases academic achievement. "Of all the educational innovations we have reviewed for this book, cooperative learning has the best, largest empirical base. "3 "Of all classroom grouping strategies, cooperative learning may be the most flexible and powerful." Cooperative learning consistently produces powerful gains in part because it includes individual accountability on an ongoing basis as part of daily instruction. Cooperative learning structures as opposed to unstructured group and pair work allow teachers to align instructional practices on a moment-to-moment basis. The proven power of individual accountability ensures academic gains. In a team context, the aphorism "There is no 'I' in team" makes good sense and serves its motivational purpose. Putting team goals above personal gains has its proper time and place. "Taking one for the team," is now a common parlance as it pervades our everyday life. In baseball, there's the sacrificial bunt—a tactical team strategy in which a batter bunts the ball and risks getting out to advance teammates around the bases. In the workplace, there's the grunt work—the dirty job that someone on the team has to do to reach the team's goal. In the military, soldiers put their lives on the line to defend the liberty of others. So, yes, sacrifices for the sake of others can be a virtue. But in the classroom, the acid test for success is the success of the individual student. Is EACH student learning, growing, and succeeding? With effective teaching strategies that integrate individual accountability, the answer is "yes." In the cooperative classroom, there is an "I" in team — and that "I" stands for Individual accountability. 1 Slavin, R. E. When does cooperative learning increase student achievement? Psychological Bulletin, 1983, 94, 429-445. 2 Kagan, S. Group Grades Miss the Mark. Educational Leadership, 1995, 52(8), 68-71. Kagan, S. Group Grades are Pointless. Kagan Online Magazine. 2000, 3(2). 3 Ellis, A.K. & Fouts, J.T. Research on Educational Innovations. Princeton Junction, NJ: Eye on Education, 1993.